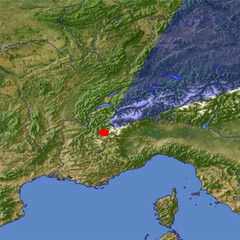 The highest peaks of the Alps are located in the western part in Switzerland, France and Italy. This view shows on the far left the Mont Blanc (4807m). Separated by the Great St. Bernard Pass the highest peaks of southern Switzerland and at the border between Switzerland and Italy, among others from right to left the Weisshorn (4506m), the Matterhorn (4478m) and the Dufourspitze (4638m). 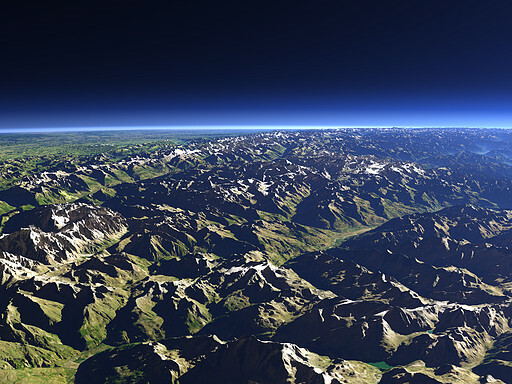 North of the Valais the Bernese Alps and in the background the Peaks of eastern Switzerland and Austria. On the right south of the Pennine Alps the Aosta Valley in northern Italy.